Retirement from a lifelong career doesn't necessarily mean an end to work. Many retirees return to the workforce to pursue a passion, earn extra money, gain health care benefits, serve their community, or to avoid boredom. In fact, retirement can signify the start of a new career for many workers who aren't ready to actually retire. Retirement can provide an opportunity to choose a different path than the first time around. It can also provide extra income and the chance to do the type of work that you wished you could have done during your last career. 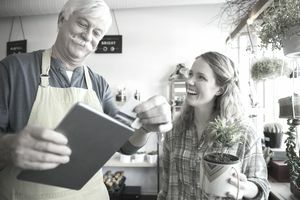 Some of the more common options for retirement employment are operating a small business, freelance work, hospitality, retail, consulting, teaching, and healthcare. However, don't limit yourself. Rather, before you start a job search take some time to explore options and decide what it is you would like to do during this phase of your working life. Take a career test or two and see what might be a good fit for your skills and interests. Also, consider how much time you want to commit and plan accordingly. Many employers would prefer to hire flexible employees who are willing to work less than full-time hours. If you don't need to work 40 hours a week, it will be easier to land a job. Consider reaching out to contacts at your previous employers if you enjoyed working there prior to your retirement. Explore part-time roles with less stress or greater appeal that will still tap the knowledge or skills accumulated throughout your career. Utilize your positive image and outgoing personality by contacting managers in-person at local restaurants, hotels, retail establishments, and other employers. Make sure you stop by at non-peak times, show respect for gatekeepers, and exude youthful energy. Tap temporary employment services for office and factory jobs. Temp agencies are a great way to access seasonal and part-time employment as well as to sample a variety of employers. Plus, temp jobs give you flexibility when you don't want to commit to a full-time position this time around. Mobilize your contacts and let them know what type of employment you’re seeking. You may be surprised to learn that one of your contacts or one of their associates could use help from a trusted source. If your connections don't need help, they may know someone who does. If you have entrepreneurial inclinations, explore the viability of starting a small business whether it is marketing a favorite craft item, providing a service like installing hardwood floors, or catering parties. Retirees often favor enterprises which require limited capital investment. Consult business people whom you know and services such as Score or the Small Business Administration before launching your business. Freelance work such as consulting, writing, design, programming, translating, medical transcribing, and data entry is a common pursuit for many seniors. Utilizing websites that match freelancers to projects can be an effective strategy. Promoting your services to your network contacts, targeting local neighborhoods with leaflets, and posting ads online and in local papers are additional methods for generating business. Here's more information on how to find freelance jobs. Check the Chamber of Commerce. Many local businesses list jobs on their Chamber of Commerce website. It's a good resource for finding local jobs. Use job listing sites. Many retirement jobs are advertised on online job boards and through local newspapers, most of which have a job board. Use the job search engines to find listings in your location fast. In addition to using the general job sites, check those that focus on jobs for retirees and older workers. If you’re collecting social security and are under full retirement age, your earnings can impact your social security benefits. Here's more about how working impacts social security retirement payments.